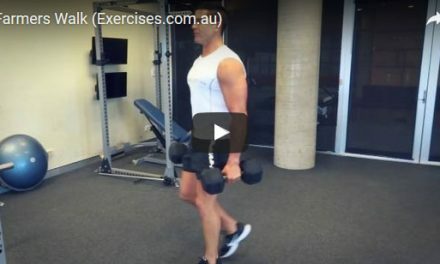 Kettlebell Thruster is a dynamic exercise that effectively targets the legs, glutes, hamstrings, hips, lower back, posterior and anterior shoulders, traps, upper back and forearms. Kettlebell Thruster engages the abdominal muscles or the core section to stabilise the upper body and support the lower back throughout the different stages of the exercise. 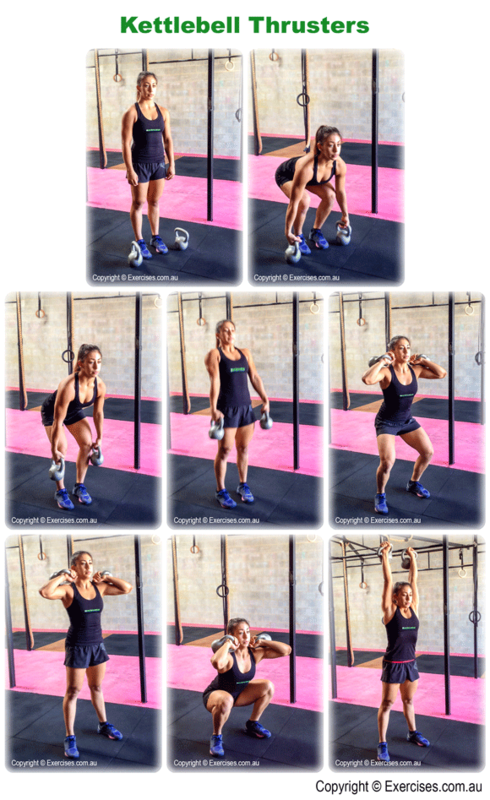 Kettlebell Thruster is a great exercise to build strength, power, coordination, balance and mobility. Assume a hip width stance and place a kettlebell along the outside of both feet which are in a neutral position. Bend at the hips then the knees and grab the kettlebell with each hand. Your back should be at a 45 degree angle; hips lower than your shoulders but higher than the knees. Your knees should be in line with your feet. Shoulders are in line with the elbows, kettlebell and wrists. This is the start position. 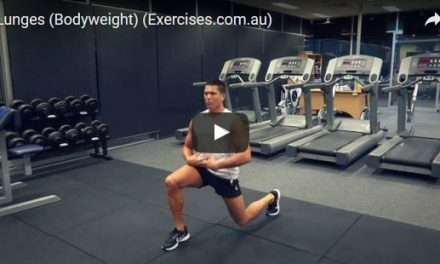 Push your heels through the floor; extend at the knees then drive your hips forward. Explode up and swing the kettlebells over your shoulders. The kettlebells should be behind your shoulders with your legs slightly bent and your hips back and knees forward. At this position, your elbows should be higher or in line with your shoulders and arms parallel to the floor. Straighten your legs and bring your feet back to shoulder width position, feet angled out as you begin the transition to the full squat. Bend at the hips then the knees. Descend until you reach a depth where your hips are lower than the knees. Maintain a flat back position, knees over the feet. Push your heels through the floor and extend at the knees then the hips. Use the power of your legs and hips to drive the kettlebells straight up to overhead lock out position. Push your head between your fully extended arms as you approach lock out. At the top position, you can bring the kettlebells together. On return, dip slightly as you bring the kettlebells to your shoulders. From there bring the kettlebells down to your hips before your return to the starting position. Bringing the kettlebell to the front of the shoulders will make you fall forward as you get to the bottom position of the squat. Positioning the kettlebell outside the shoulders will get you in a good bottom position in the squat but will force your arms to press too far out to the side at the thruster stage. Always keep the kettlebells behind the shoulders throughout the exercise.